Home Uncategorized HAWK RISING, an interview with Maria Gianferrari, + a giveaway! 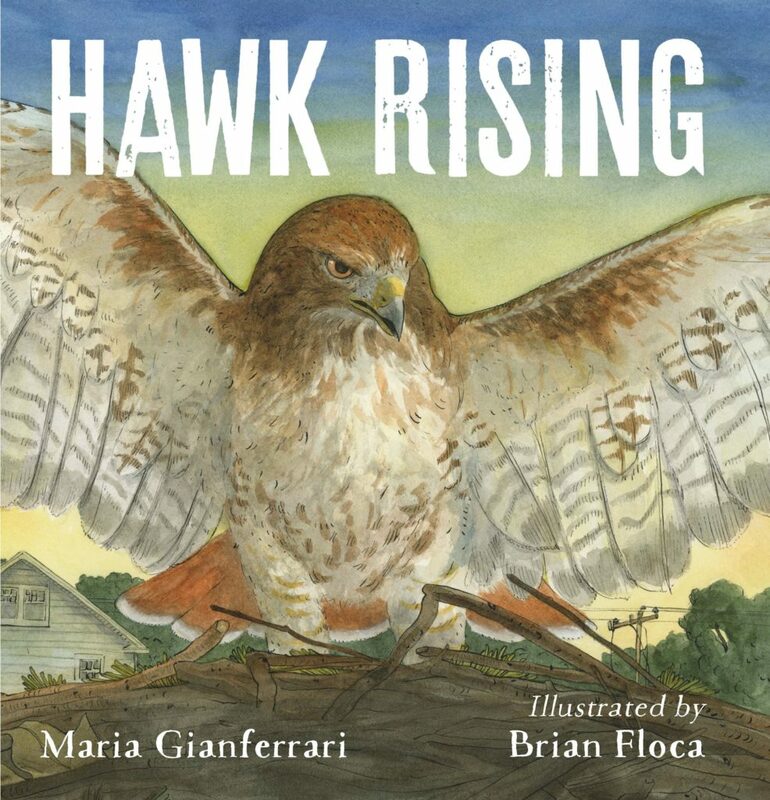 Maria Gianferrari has another beautiful nature book hitting shelves this Friday, Hawk Rising (Roaring Brook Press, illus by Brian Floca). I started writing this post three or four times, but I kept getting hung up … where to begin, where to begin… because the book has so many great elements and I didn’t want to leave anything out, and then I decided to read its reviews, and … phooey. There was everything I was trying to say. But, you know, BETTER. So I’m going to be a little lazy in the top half of this post, but only because I’ve interviewed Maria below. Yes, that. 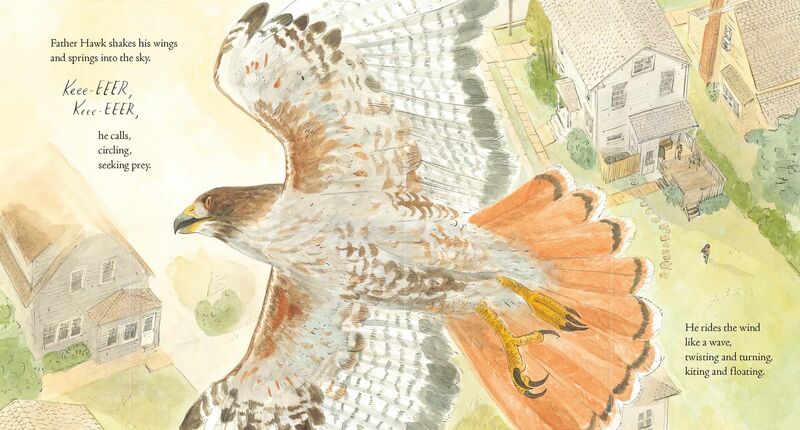 And whether or not your kiddos are little naturalists, this book holds extreme appeal, partly because the POV alternates between you, down there on the ground watching, and the hawk itself, soaring in the sky. In its starred review, Publishers Weekly said: “…. Muted hues illustrate moments from Father Hawk’s day as he scans for prey, sunbathes, dives after a chipmunk and sparrows, and finally snags a squirrel to bring back to the nest. All this plays out under the scrutinizing eyes of two young bird-watchers: a girl and her younger sister in a suburban neighborhood, who use binoculars to follow the progress of the feathered hunter…. Painted from varying angles, dynamic spreads and vignettes present the shifting perspectives of bird-watcher, hawk, and prey. The clever pacing and placement of text match the bird’s actions across, up, and down the page. This captivating introduction to the red-tailed hawk concludes with more than a half-dozen facts about the common bird of prey and further reading.” See? Pretty much covers it all, doesn’t it? So let’s get to that interview. JE: First of all, why hawks? MG: I am an animal lover, and ironically, though I am very emotional about animals, I am also completely fascinated by predators and raptors in particular—they’re doing what they’re meant to do, and they are such a critical component for maintaining ecosystem health. I am pretty much obsessed with red-tailed hawks—they’re the most common hawk in North America, and live in all kinds of habitats, even big cities, like New York. Urban ecology is a passion of mine, and I have a deep appreciation for hawks’ adaptability and ability to live so close to humans. My favorite past-time is searching for perching hawks while driving, and watching them on webcams like Cornell Lab of Ornithology’s All About Birds. And Brian Floca’s art soars—it brought these majestic creatures to life. The language in HAWK RISING made me swoony, Maria. I couldn’t help but marvel at your lyrical, poetic lines, so tight and evocative. Was this the format from the very beginning stages of drafting, or do you revise your material down to this point as you go along? MG: That is very kind of you to say, Jill—thank you! My general process for writing narrative nonfiction is to try to be as spare as possible in my approach and to leave a lot of white space. 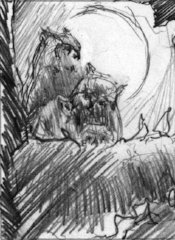 I think it starts off a bit wordier, and then gets pared down and distilled through the drafting process to its most basic form. JE: Because people always want to know…Do you stick to a writing schedule? MG: My dog, Becca, is my writing companion, so every day starts with a walk and time to reflect, rain or shine, before I sit down at my computer to write. I try to write every day during the week, and occasionally on weekends. I am also a perennial napper, so I take nap breaks between writing sessions. JE: I seem to remember a mention, the last time you visited, of a bobcat book. When will that arrive, and are there other animal bios we can look forward to? MG: You are correct! I don’t yet have a release date, but I am very excited to be collaborating once again with Bagram Ibatoulline, illustrator of Coyote Moon, and editor Emily Feinberg at Roaring Brook Press on A Home for Bobcat. Emily is also the editor of Hawk Rising as well as Hello Goodbye Dog. I love working with her! JE: What else do you have in the pipeline, Maria? 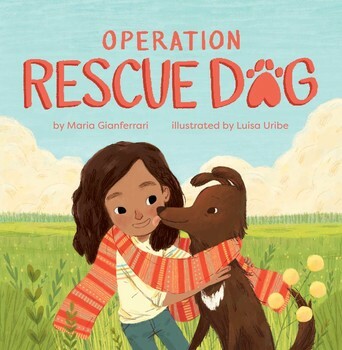 MG: My next fiction picture book is near and dear to my heart: Operation Rescue Dog, illustrated by Luisa Uribe and published by Little Bee. I’m a dog lover, which is pretty obvious: all of my current fiction picture books star dogs as main characters. Woof! 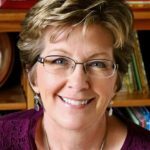 Thanks for having me on Picture Book Builders, Jill! It’s an honor to be here, since this is one of my favorite blogs. Maria has another new book out, too. 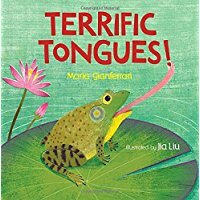 Don’t miss Terrific Tongues (Boyds Mills Press, illus by Jia Liu). You can learn more about Maria here, on her website. Also…ONE lucky commenter will win a copy of Hawk Rising! Open to residents of continental U.S. only. The WINNER of Josh Funk’s How To Code a Sandcastle is Danielle Dufayet! Congratulations, Danielle, and thanks to everybody who entered! Boyds Mills Press, Hawk Rising, Jill Esbaum, Maria Gianferrari, nature, picture books, red-tailed hawk. Bookmark. This looks lovely! Thanks for the chance to win! Thanks, Michelle & good luck! Another terrific book by Maria to look forward to! Thanks for the great interview, Jill and Maria. Looking forward to reading this one. Thank you for the post Jill & Maria! Great interview, Jill. Just read TERRIFIC TONGUES! and loved it! Looking forward to reading HAWK RISING. Thanks, Judy! I know you’ll love HAWK RISING. Soooo pretty! I look forward to reading your book on hawks and have already marked Terrific Tongues to read on Goodreads. Thanks for the post! I hope you will enjoy them both, Tracy! Looks like an excellent book! Love this interview! Congrats on Hawk Rising!!! Thanks for introducing us to Hawk Rising. My husband and I love watching predator birds in our back yard and when we travel. They are such fascinating creatures! This will be a great read for my hephew. I agree!! They are fascinating indeed, Kathy!! Enjoy your bird-watching! Looks great, Maria. As a birder, I’m quite excited about this book, although I do love all of your books. Yay–another bird nerd. And you are very kind to say that, David–thank you!! Gorgeous! Can’t wait to read this one. We have a pair of nesting hawks who constantly fly over our pasture. They are at the teaching the kids how to fly and hunt stage. Very noisy but fun! Congratulations! Brian’s art is absolutely stunning–I am very lucky to have been partnered with him! How cool!! Enjoy your bird-watching sessions! I look for perching hawks too! I’ve always wondered what they see and think while way up on those highway lamp posts so I’m excited to read about their perspective. Congrats, Maria! It’s kind of addictive, isn’t it, Jodi? I love watching them so much!! Thank you!! Thanks for introducing me to a new author! So many books I want to read! Hawk lovers could check out a favorite of mine: The Hawk of the Castle, a Story of Medieval Falconry. Hawk of the Castle was beautiful!! I loved Bagram’s illustrations. He illustrated my book, Coyote Moon and the art is incredible! Thanks for the recommendation, Susan! My husband and I love spotting red-tailed hawks whether we are driving, hiking, or kayaking…looking forward to reading this book that includes the hawk’s perspective of looking down on us. What a great follow up to Coyote Moon! Thank you, Jill and Maria! I look forward to reading this as a mentor text. Maria’s tight, evocative, poetic text pulls readers right in. Can’t wait to see and read this book! Love Coyote Moon and can’t wait to experience Hawk Rising. Thank you for expanding our perspectives of urban predators, too. As we continue to infringe on their habitats, it is important to learn more about them as our neighbors. Maria, you are everywhere today. Good to see what else is coming out and in your pipeline. Love Jill’s blog, too. Maria, you are everywhere today. Glad to see more spread of HAWK. I enjoy Jill’s blog, also. That is because our kidlit community is so wonderfully generous!! I am so grateful!! Thanks, Kathy!! I’m eager to read this—spare poetic text with lots of white space—also hawks—great subject. Looks beautiful, too! Huge fan of white space here, Lynn :)! Brian’s art is so gorgeous!! This sounds like a lovely book. I will certainly be watching for it. Maria, you know I’m one of your biggest fans! I got my copy today. . . .gorgeous language, gorgeous illustrations. Just such a perfect picture book. It is one of my new faves. Ditto, Deb!! <3 <3 🙂 Thanks so much for all of your support!! You had me at the cover. Such a magnificent bird! It’s a pretty perfect cover–I just love it!! Thanks, Kathy! Looking forward to reading this beautiful book! As long time birder myself, this might be my favorite of Maria’s lovely books! And I love Brian’s art. So excited for Maria about all her upcoming books! This looks amazing. Look forward to reading it. I love Maria’s books. We have red-tailed hawks behind our house that I’ve witnessed preying on birds visiting my neighbor’s feeder. They strike fast. The cover of this book is amazing and I can’t wait to read it for myself. Thanks for the interview and chance to win a copy. Hi Maria! Thanks for sharing. I love the inside spread of Hawk Rising. It reminds me of the pouncing spread in Coyote Moon. So true!! Thanks, Manju & hello :)! I love the sound of the red-tailed hawk and think it was captured in the page you displayed. The language is also beautiful and I can’t wait to get my hands on the book so I can experience the language and illustrations in their entirety. Thanks Jill and Maria. I hope that you will enjoy it, Jane. The art is absolutely amazing! We have a hawk that perches on our deck. It is an amazing creature. I can’t wait to read HAWK RISING! Creatures beware!! Thanks & I hope you’ll like it, Linda! In my mind seeing a hawk is almost like seeing a shooting star. Rare and beautiful. I am so glad that a picture book has been written about these amazing birds! I am a huge fan of Maria’s and look forward to reading her Operation Rescue book as well. Thank you for sharing the interview and offering a giveaway. I feel that way when I see creatures–like it is a blessing, and I am honored, and so grateful. Thanks for the kind words, Jen! So glad you won a copy of Terrific Tongues too! Suburban hawks fascinate me too. I saw one catch, kill, then eat a pigeon. I cannot wait to read this and your future releases. I’m looking forward to reading the owl book told in narrative form using haiku. I’ve tried that style of writing and it’s not easy. Congratulations, Maria–the book looks gorgeous! I share your fascination with hawks, which are so striking and majestic. (In fact, my mother’s maiden name was Hawk, and it’s our son’s middle name too.) Can’t wait to read it! Hello Linda!! Hawk as a middle name is very cool! Thanks & I hope you’ll like it :). I am so excited about this book! I just received Terrific Tounges and I can’t wait to read it. I feel like seeing a hawk is like seeing a shooting star! Rare and beautiful I look forward to reading Operation Rescue Dog as well. Thank you for sharing the interview and offering a giveaway. I’m sorry about that. It didn’t show up so I did it again. I am so excited for this book. I can’t wait to read it. Looks absolutely lovely – can’t wait to check it out! Thank you, Monika!! Brian’s art is stunning. What a beautiful book and a wonderful interview. I appreciated the couple of takeaways for writers wanting to improve their craft. Thank you! 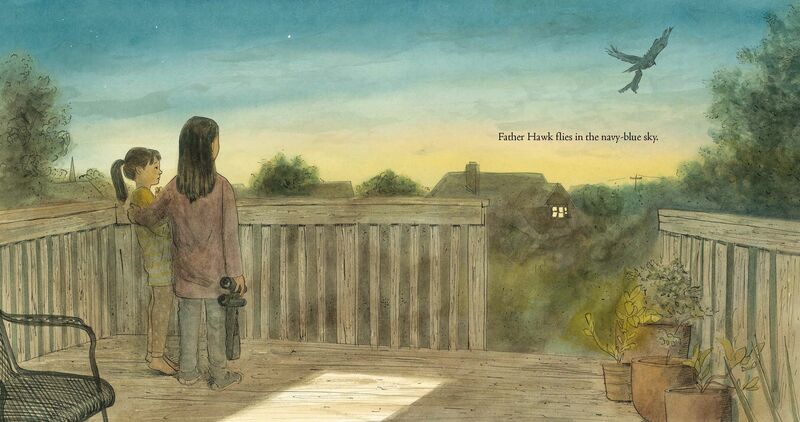 This looks like the perfect book for my bird-watching granddaughter. Lovely. I am brand new to Jill Esbaum’s blog post, but am delighted to find it and see this wonderful book featured! Great writing and the illustrations are breathtaking! I cannot wait to share it with my 7-year old grandson. I have a pair of red-tails that have nested in the high wires near my suburban home for years. One even came to roost on the lower branch of a tree 30 feet away, on the edge of a children’s park, where I had gone to play with my grandson. She was so close we could see her breast feathers ruffling, as she calmly looked down at the two of us. Whenever one appears, I am reminded of their message as a spirit animal – to look at my life from the higher vantage point. How cool, Ellen!! Love that story! I can’t wait to get my hands on this one! Hawks and birds of prey are some of my favorite creatures! This looks so good. Love the cover. Looks wonderful. I’m excited to hear there’s one coming on great horned owls. Congrats! Thanks, Mary. I’m excited for it to come out!! Looking forward to Hawk Rising, Maria. We have several red-tailed hawks that nest along the creek through our property. Watching them circle and glide on the air currents overhead makes me so wish I could fly, too.